« Essen 2012, here we come! 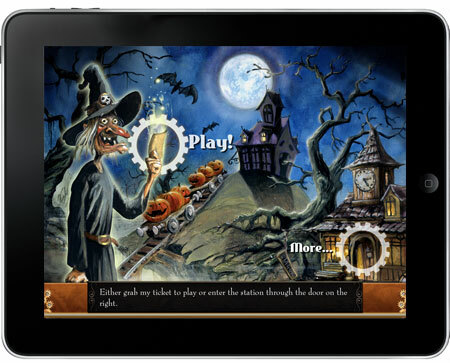 Ticket to Ride iPad will haunt you this Halloween! Our skeleton crew at the Days of Wonder Mansion has released a haunting update to Ticket to Ride for iPad just in time for All Hallows Eve. Rabid fans of the game will be treated to a haunted train station with killer game skins; and tricked to pursue buried-alive achievements and catch ghosts that will make them undisputed Pumpkin Masters of the Ticket to Ride Universe. There are two devilishly tricky Halloween achievements in this special Halloween version, but the rewards are wicked fun. We’re not coffin up many clues, as the new achievements are shrouded in mystery, but who wouldn’t want to be a “Ghost Catcher” or a “Pumpkin Master”! This updated version also makes it a breeze to share hard-won achievements (including the 2 all new Halloween-themed ones) on Facebook or via Twitter. There’s a special Halloween treat for the first 10 players who will claim both new Halloween achievements and share them on Facebook or Twitter with the new Achievement sharing features. Simply take a screen shot of your achievements posted on your FB page or Twitter feed and send them to halloween@daysofwonder.com. The first 10 players to send us shots of their posts will receive a free copy of our new Halloween Freighter Train and Station set. The update to our Ticket to Ride App(aritions) bleeds into the app store today. You can update or purchase Ticket to Ride for iPad now by visiting the App Store. This entry was posted on Thursday, October 18th, 2012 at 16:02 and is filed under Days of Wonder Online, Events, Games, News, Ticket to Ride. You can follow any responses to this entry through the RSS 2.0 feed. Both comments and pings are currently closed. I have been a ticket to ride player for years. However, I am so upset that you have yet to release any of these type features for the pc version or that you haven’t adapted it for Android based pads. When will you be doing that? I know I am not the only one who would love to see that and you’d be opening it up for soooooo many more players! When is this update coming to the iphone version? There are updates coming to both Ticket to Ride Pocket and Ticket to Ride Europe Pocket, but they won’t be available before sometime in November. These updates will focus on bug fixes and won’t contain the (by then obsolete) Halloween skin. Thank you, thank you for letting us know about Pocket updates! Much needed!!! Am I supposed to see the new skin after updating? Also how do you catch a ghost?? When will we know who has won? Love the new Halloween look – brilliant! don’t want the seasonal skin so why force it on me? how do i get the fixes/enhancements with this recent update and NOT the skin?? Huge fan of Ticket To Ride here & just wanted to know what your future plans are for the Steam version. It feels like it gets neglected compared to the iOS version. I hope you guys work on it some more because it is still lacking a lot of elements/animations from iOS; features that make the game great. Thanks. I also don’t have an i pad. I have the PC version. I feel cheated that the PC players don’t get the opportunities the i pad folks do. Disappointed immensely. Got it done and entered…thanks for the challenge! Got both & posted – A fun theme – Thanks! Any hints or tips for completing the Pumpkin Master achievement? I did it w/all orange, but would taking the black side of a black/orange pair (thereby blocking it) have been good enough? no, you have to have the orange side of the pair. Do you have your ten yet? Just did it! Hope I’m one of the ten! Love the Halloween skin… Will I be able to keep it after Halloween? I read somewhere that I I could get a Halloween Avatar, but haven’t found a way to get it. Any clues? How do I catch the ghosts? Is it as simple as tapping them (which I haven’t been able to do either)? Can’t see the skin and it sounds lots of fun, any ideas? Can see the 2 new achievements though so it seems like it has downloaded. I got the skin and have played a few times. Now when I open the app the skin is there but I don’t see the witch to start the game…..seems to be frozen!!!!! How do I fix this?????? Michelle – Try closing down the application completely and restarting it to see if that helps.